The blue merit badge card needs to be filled out properly, printed neatly in ink, and signed and dated by a Scoutmaster before beginning the merit badge. Any Scoutmaster can sign a card for a merit badge taught within the troop; however, only Mr. Cain can sign for a merit badge to be taught outside of our troop. The merit badge form has three parts. One part is retained by your counselor (Counselor’s Record), one part is retained by you (Applicant’s Record), and one part is given to Mr. Schmidt (Application for Merit Badge). If you do not provide the Application for Merit Badge, the merit badge will not be awarded at the next Court of Honor. The Scout is responsible for filling out and turning in the merit badge card. Merit badge cards will not be accepted from anyone other than the Scout earning the merit badge. If for some reason we do not award a merit badge and you have given us the blue card, please let or Mr. Schmidt know immediately. You should show us the blue card you have kept. If you were unable to attend a Court of Honor, you may pick up any merit badges, rank advancements, or awards which were to be awarded, at subsequent meetings. Please contact Mr. Schmidt and the merit badges and/or rank advancement will be given to you. 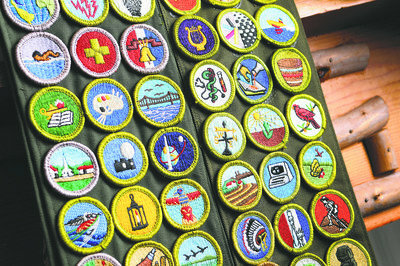 Record keeping: The scout is responsible for keeping his personal records for his merit badges and rank advancements. For merit badges, the Scout will have the Applicant’s copy of the blue merit badge card to keep as evidence that the badge was completed. At the time the merit badge or rank advancement is awarded, the Scout is given a card with this badge or rank advancement stapled to it. This card should be kept in the Scout’s personal records as evidence that the badge or rank was awarded. Troop 642 Name Tag (Above Left Pocket) – Not Jamboree Nametag! This is different than BSA guidelines on the above diagram. The name tag interferes with the merit badge sash so we wear it over the Left pocket. Scout Belt (Either Green Web or Scout Leather with Scout Buckle). Scout Socks (Either Knee Length or Crew Length – Not Ankle or Short). Leather Dress Shoes – Polished (No Boat Shoes, Tennis Shoes, Moccasins or Hiking Boots). Merit Badge Sash (If You Have Five Merit Badges or More). If you wear an undershirt it must be a white v-neck (Not Colored and Not Crew Neck). You should check your Uniform each week before you attend a meeting. Make Sure Your Uniform Properly Fits and is Clean! The Scoutmaster conference is the opportunity for the adult leadership in the Troop to gauge the advancement of the Scout and ensure he is participating in and benefiting from his experience. In Troop 642, we have a tradition of checking that certain Scout-ology is learned and retained. Listed here are the things that our Troop puts value in for the scout to learn. So, use this as a study guide for your next Scoutmaster conference but, remember, use your Scout Book as the ultimate source of information. You should remember all the requirments for you rankandall previous ranks. 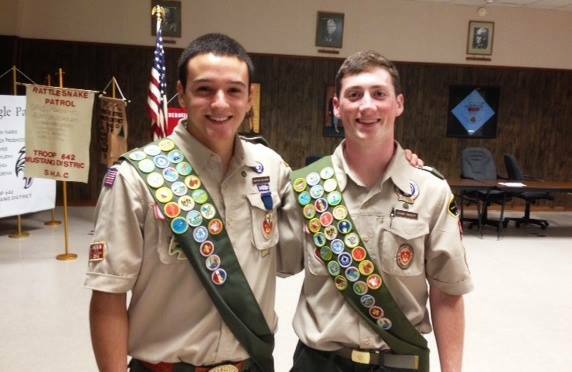 What does each point of the scout law mean? What are the three parts of the Scout Oath? What do the two stars stand for? What about the eagle and shield? Know the “Hurry Cases” and how to treat. The information is hidden in clear text on pages 292-302 of your scout manual. What are the five common signs of a heart attack? How do you perform the Heimlich maneuver? When the victim is lying down? How do you perform CPR? When should you and should you not perform CPR? Once started, when do you stop CPR? What is and how do you treat Shock? How do you treat heat exhaustion? How do you treat heat stroke? How do you treat a snake bite? How do you treat a small cut or abrasion? How do you get a splinter out of a finger? How do you remove something from your eye? How do you treat a blister? How do you remove a fish hook? What do you do to treat poison ivy? How do you raise a flag? How do you lower a flag? When is it OK to fly a flag at half mast? How do you raise a flag to half mast? How do you lower a flag from half mast? When is it OK to fly a flag upside down? When is it OK to fly a flag at night? When is it OK to fly a flag in bad weather? What is the proper way to address a flag? Where does a US flag sit on a stage or in front of a room? What side of a color guard is a US flag carried? What do the stripes represent? What is the area of the flag that contain the stars called? What is the name of the ornament on the top of a flag pole? What is the rope called? What is the name of the thing that you tie the rope too on the pole? One last thing. Don’t rely on this to be the complete and only list. Each Scout Master has his own personal favorite thing to check your knowledge and preparedness. A Scout keeps his body and mind fit. He chooses friends who also live by high standards. He avoids profanity and p0rn0graphy. He helps keep his home and community clean.